Pasta salads are one of the most versatile dishes anyone can prepare. A pasta salad basically consists of pasta and any vegetable, meat or seafood you can think of tossed with a nice dressing. Since there are such a variety of pasta noodles available it is easy to be creative. Even if you use the same basic ingredients when you prepare a pasta salad it can become new all over again by using a different type of pasta. Shells, gemelli, bow tie and cavatappi are a few of the pastas I like to use in cold salads. They have little ridges that absorb whatever dressing you use and most of them just have a cool shape. For my Shrimp and Pasta Salad I used small pasta shells because I wanted the pasta to cuddle some of the dressing and provide a subtle burst of flavor with every bite. The veggies I used with this pasta salad were meant to make the dish colorful with the deep green of the asparagus and the bright red of the peppers and tomatoes. The shrimp added a pretty pink hue that pulled everything together. Most of us are first attracted to a dish because of the way it looks. If a dish looks weird, we figure it will taste weird too. Although that is not always true it is human nature to judge certain things by the way they look. That is way it is important to add rich vibrant color to every meal. 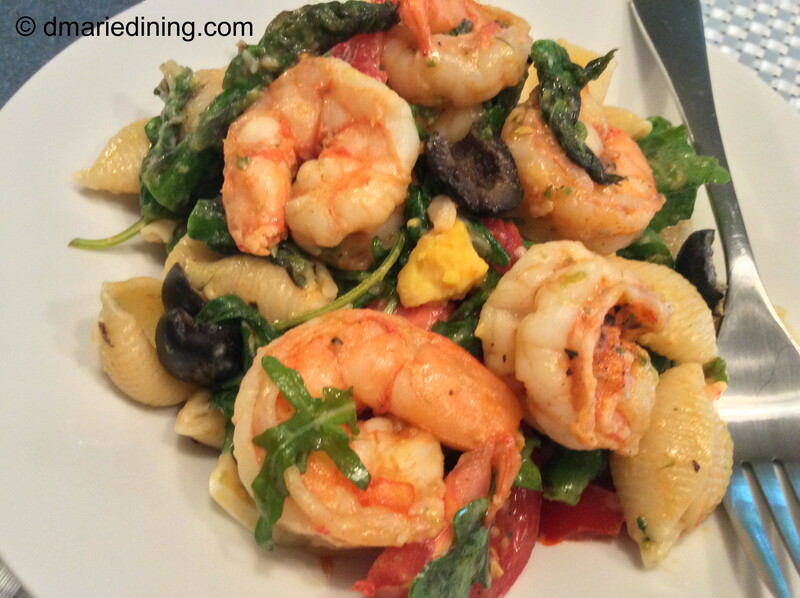 My Shrimp and Pasta Salad is both appealing to the eye and tasty on the tongue. Try it as a main course or side dish. Either way I think you enjoy this simple flavorful salad. Prepare pasta shells according to the package – al dente. Set aside. In a large skillet heat butter with olive oil over medium high heat. Add shrimp and lemon juice. Stir and then add ½ tsp salt, ½ black pepper and old bay seasoning. 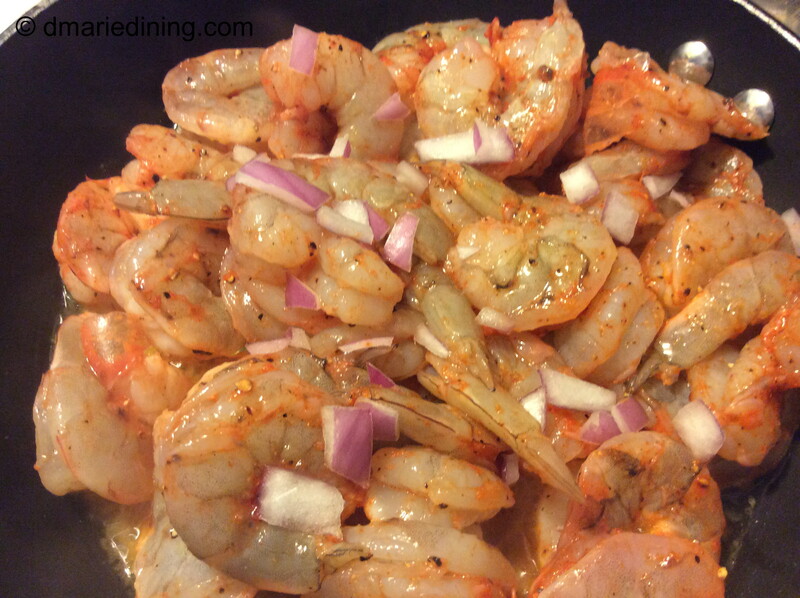 Cook until shrimp are pink. Remove with a slotted spoon and place in a bowl. Set aside. 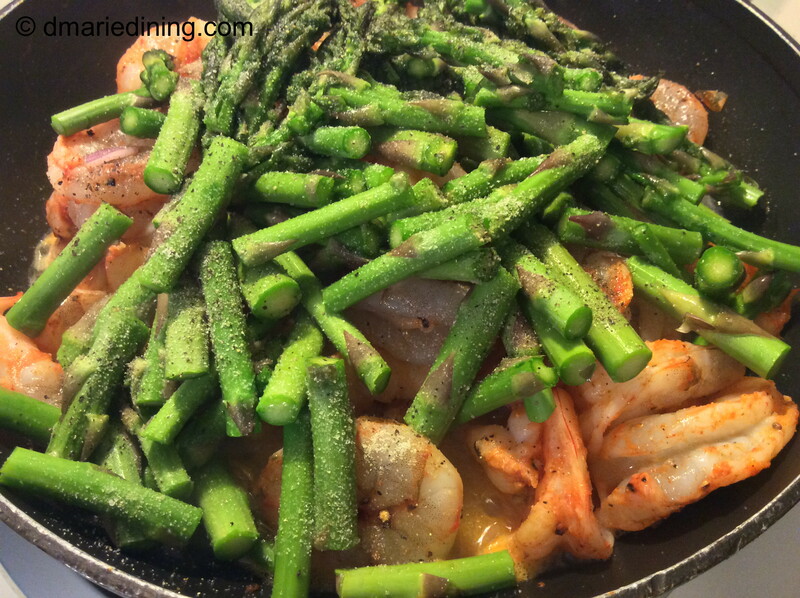 Add veggies (except for tomatoes) to the same skillet and add remaining seasonings. 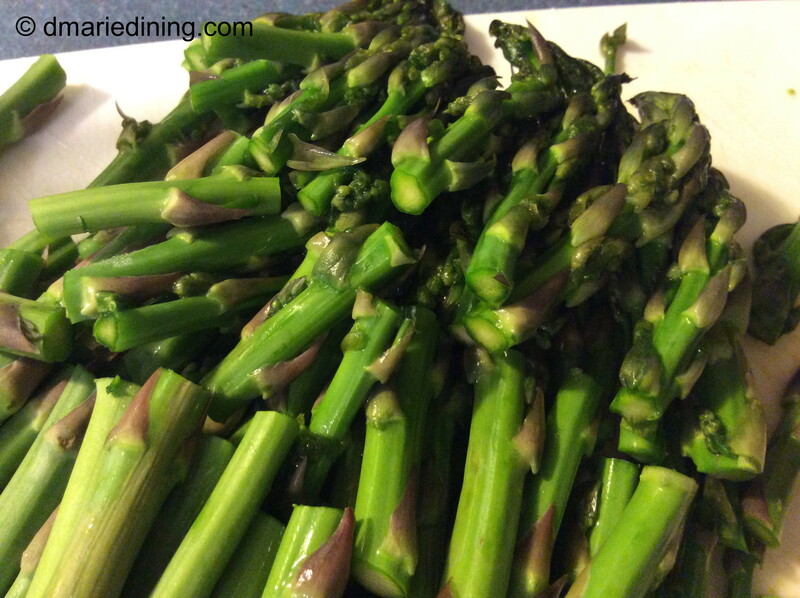 Cook for 2- 3 minutes until veggies soften slightly but still crisp. Do not over cook. 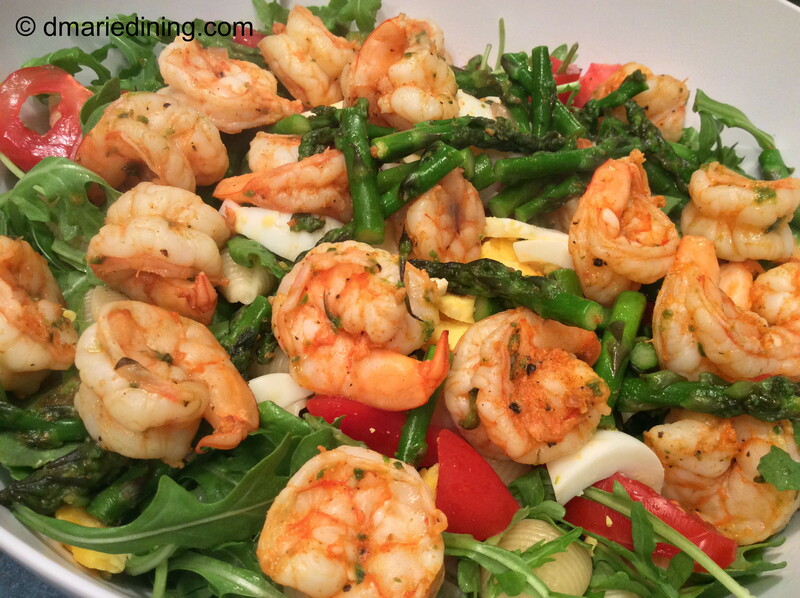 In a large bowl add pasta, shrimp, veggies, arugula, eggs, tomatoes and olives. Drizzle with vinaigrette and gently mix. Serve with a nice side salad.